Every dog has two ages: their biological age and their age in “dog years.” Calculating dog years was once thought to be as simple as multiplying by seven. A two-year-old dog was 14, a three-year-old dog was 21, and so on. Modern research has shown that this calculation is outdated because it does not take breed or size into account. With so much variation within the species, these two factors play a major role in determining a dog’s age and life expectancy. Dogs are the only species on the planet with such a massive range of shapes, sizes, and physical characteristics, so there cannot be a one-size-fits-all calculation for how they age. A study led by Dr. Kate Creevy of the University of Georgia College of Veterinary Medicine found that larger canines have a much higher chance of dying from cancer, intestinal diseases and musculoskeletal problems. Golden Retrievers and Boxers are known for having extremely high cancer rates, and are often afflicted at a young age. Similarly, breeds such as Bulldogs and Pugs are at a much higher risk for respiratory crisis due to their short skulls, elongated soft palates, narrow nostrils, and excess body weight. Clearly, size and breed play a major role in determining a dog’s life expectancy, and therefore, their true age. During the first two years, small dogs age faster than their larger cousins, according to Dr. Creevy. They have a shortened adolescence, reaching their full body size by nine to 12 months of age. Large and giant breed dogs reach their full skeletal size around 18 months, but may not hit their full body weight until two-years-old. After the first two years, small dogs enjoy a longer adulthood, often living well into their teens. Sadly, very large dogs such as Great Danes and Mastiffs have a life expectancy of only six to 10 years. For dogs three and up, breed begins to play a large role in the aging process. Based on the individual traits of several popular breeds, Dr. Creevy recommends adding the following number of dog years for each additional calendar year. Using these calculations, you can begin to see just how much breed and size affect a dog’s age. A five-year-old Dachshund is approximately 38 in dog years, while a five-year-old Boxer is more like 45. Unless your dog came from a breeder, chances are you do not know their exact birthday. This makes estimating a rescue pup or mystery mutt’s age all the more challenging. Looking at their eyes and teeth can provide valuable clues, as can the condition of their skin, coat and joints. Puppies and young dogs tend to have bright, clear eyes free from cloudiness or discharge. As dogs age, the lens of the eye hardens causing a faint bluish film. This process is known as lenticular sclerosis, and while it does not impair vision, it is a good indicator that the dog has reached middle age or older. Lenticular sclerosis is not to be confused with cataracts, which are whitish and opaque. They decrease the amount of light that can penetrate the eye and diminish vision. Cataracts can occur in younger dogs for a variety of reasons, but age-related cataracts usually present in dogs over six. Grey hair is a common sign people use to estimate a dog’s age range. Age-related greying tends to begin around the muzzle, and spread out across the face, legs and body. 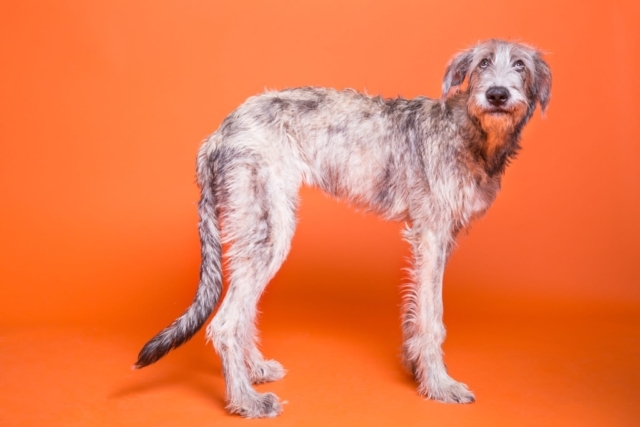 Check out these grey-faced cuties for reference! Older dogs may also have looser skin with less moisture than younger pups. Depending on health, a dry, brittle-feeling coat may indicate an older pooch. Arthritis can occur at any age, but senior dogs are at higher risk. You may also notice muscle wasting in older dogs, especially around the hips and shoulders. Keep in mind that depending on a dog’s lifestyle, they may appear older than they actually are. When in doubt, ask your veterinarian to help you determine your dog’s age.